"Hei no Naka no Chuugakou" centers around Asahi Junior High School, which is located within Nagano Matsumoto Boy's prison in Matsumoto City, Nagano Prefecture - the only public school in Japan that is located inside a prison. The school's students are all prisoners ranging in age from 20-70. The students are carefully selected after taking an entrance exam and being selected by the school's admission board. 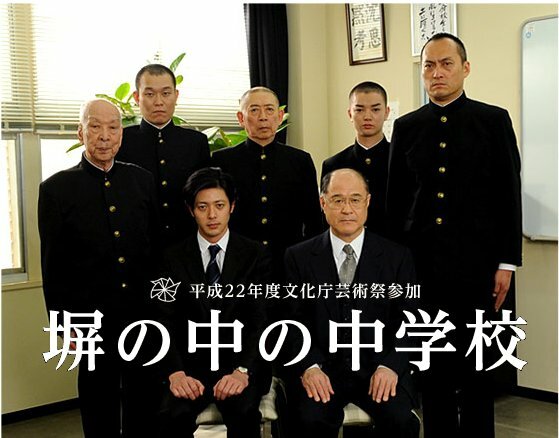 Special permit was received for the drama special "Hei no Naka no Chuugakou" to be filmed inside Nagano Matsumoto Boy's prison. kidd Oct 23 2011 9:29 pm The title is wrong.the Kanji read chuugakkou instead of chuugakou.